Why is Irish coffee so popular? Of all the liquor coffees we make here at Christopher’s, Irish coffee is the most popular. It’s even enjoyed by non-whiskey drinkers. I think it’s the very specific taste produced by the combination of sweet and bitter. 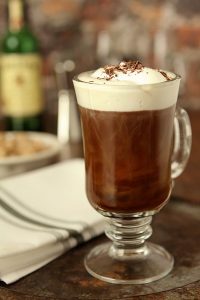 The first Irish coffee was created in 1943, by the chef at Foynes Port in Limerick, Ireland. He made it as a warming beverage for passengers on a transatlantic flying boat, who had been forced to return to Ireland because of bad weather. The coffee became incredibly popular, and today is served in bars, restaurants, and licensed cafés around the world. How do you make the perfect Irish coffee at home? Before you start, heat a glass coffee cup, and leave hot water in it while you whip the cream. The cream should be bubble free but still pourable, with ribbons forming under the whisk (you can use pre-whipped cream as a substitute). Dissolve the sugar in a small amount of hot water, so that it turns syrupy. Stir the whiskey into the sugar solution. Empty the hot water from the coffee glass, and pour the sugar and whiskey solution into the glass. Pour the hot coffee into the whiskey solution. Pour the cream onto the coffee, using the back of a spoon to regulate flow and stop it from sinking. Grate the nutmeg over the top, or sprinkle a little chocolate powder (to your taste). Of course, in the restaurant we cheat a little – we have a coffee machine to heat the water and whiskey, and our coffee is always freshly brewed. You might also try a simple Baileys coffee. Coffee, Baileys, and cream. And rather delicious it is, too! Next time you dine with us here at Christopher’s, ask for your favourite liquor coffee. It’s one of the bar’s specialities. Why not join us for ‘An evening with Rees’? Our first special event of 2018 is drawing close, and we only have a few tables remaining. 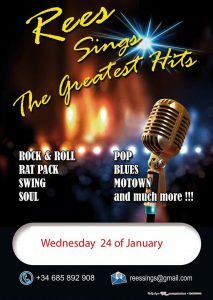 If you fancy an evening of fine dining and magical music, ranging from Rat Pack to motown, soul, blues, and beyond, call us on (+34) 600 01 28 24 to book your table and enjoy an evening to remember at one of Torrevieja’s top 10 restaurants (as rated by diners on www.tripadvisor.com).